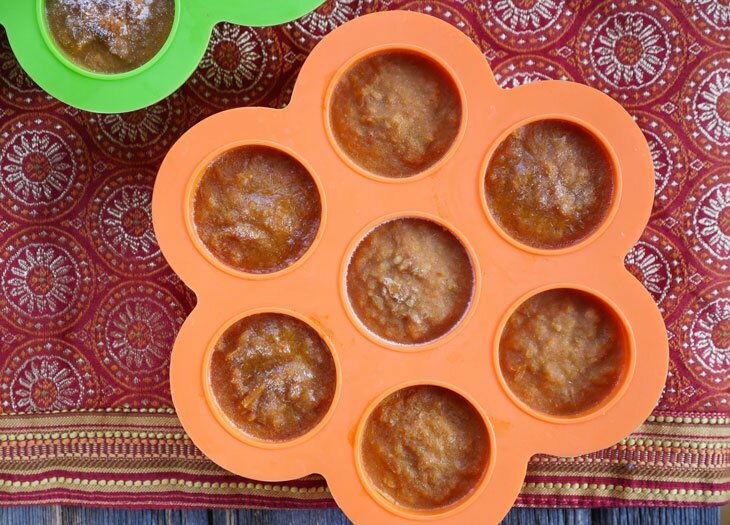 The short version: I store it in these silicone molds – each mold holds 1/4 cup of onion masala. 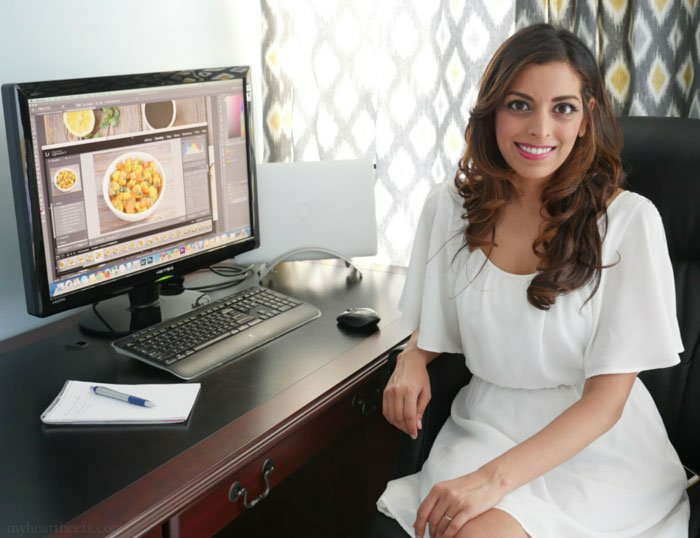 Ashley – how do you freeze your onion masala? in ice cube trays (so a specific size)? Or some other way? I made your Instant Pot Butter chicken yesterday and it was yummy! I also use pre-made Onion masala except that I have not yet figured out how much to use in a dish. I went to your Onion Masala Blog series but cannot find a link to recipes that use this pre cooked Masala to understand the quantity needed. Could you please guide me. Hi Madhavi, I’m so glad you liked the butter chicken! 🙂 And I’m so glad you’re interested in this series! 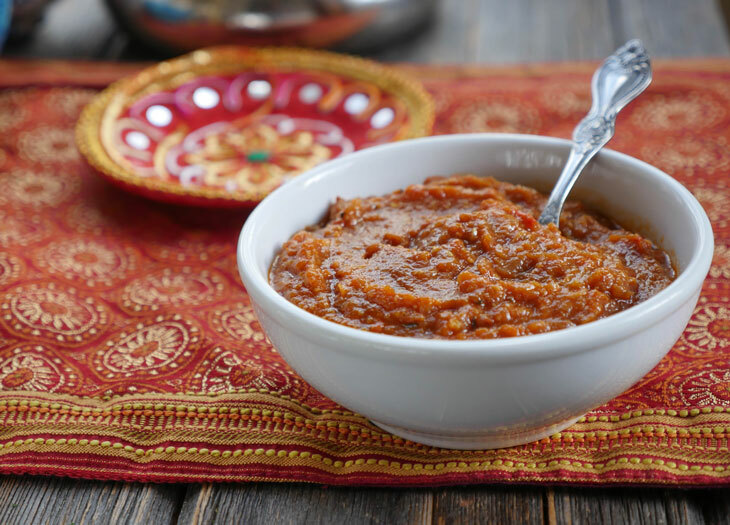 This is a series that I am working on during the month of February, so I will update the blog with recipes that call for onion masala throughout the next several weeks. 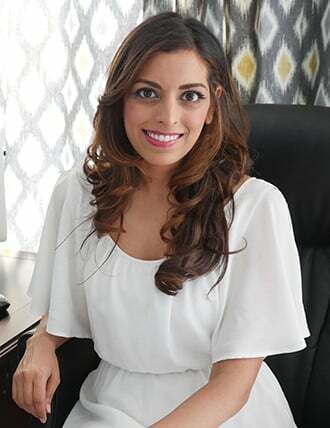 You’ll be able to find the recipes that call for Indian Onion Masala here: https://myheartbeets.com/indian-onion-masala-recipes/ Right now it just says coming soon but stay tuned! Yes, but butter chicken was not used as one of the recipes that you can use with the onion masala. So if it can be used for butter chicken, what is the amount and do the spices listed in the butter chick need to me added still? You can use it with butter chicken! 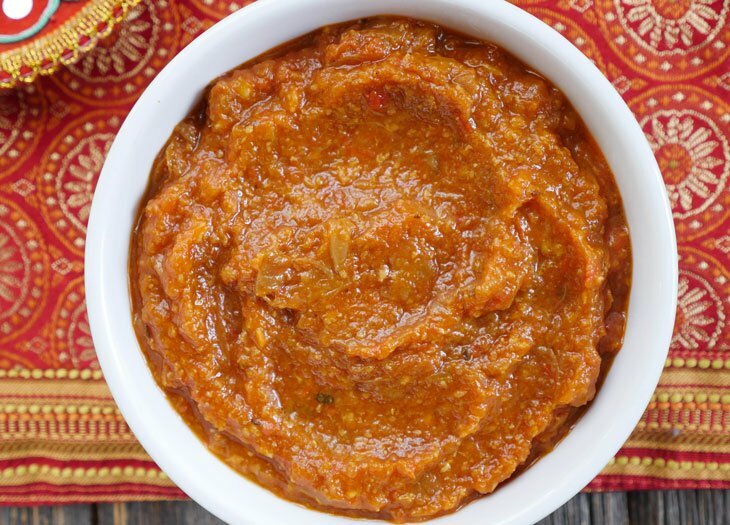 My guess is 1 cup of masala – if you try it out, let me know how it goes! 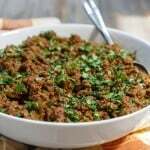 You can also reduce or remove the same spices that are in the masala. Can this be made without oil? I don’t use any oil, butter, or fat at all because it does so much damage to the arteries. Thank you. JEM – I made it without oil this morning. It took a lot longer for the onions to brown – a good 30-35 mins before I was close to the colour in Ashley’s picture, but other than that no problems. I used a little bit of water in the beginning to saute the onions and then when I deglazed after about 20 mins and again a couple of mins before I added the garlic/ginger. Just a splash each time, which surprised me. I thought I’d need more. I was worried about scorching once I went to pressure but no issues. The other thing to bear in mind is that for the recipes where you use the masala, you’ll want to keep a closer eye as you’re cooking just to make sure you don’t need to adjust for the residual oil from the original recipe. I have to tell you, my kitchen smells AMAZING right now so I’d say definitely give it a go! Donna, thanks so much for sharing! Hi Ashley. Kindly advise adjusted cooking time / method if making this on a stove top..
Hi, you can definitely make this on the stovetop – just sauté the onions until browned then cook the tomatoes until they fully break down. This takes a long time to do on the stovetop. If you have an electric pressure cooker, I highly recommend using that as it’s a huge time saver! Hi! Can you tell me how much onion masala this yields? Thanks so much! I just finished my first batch of onion masala and I’m moving on to toor dal. We’ve been wanting to make it for ages! Fun fact, I have a Duo Mini and this recipe fit perfectly. I’m hoping the same is true for the dal! I am wondering how many 1/2 cup servings (or 1/4 cup) your batches usually make? I made this yesterday and I think mine might be a bit thin and I’ll just adjust portion size that way. Thanks in advance. Looking forward to trying it out. Hi Emily! Sorry for the late reply – I think you posted this in my FB group as well – hopefully more folks will be able to help. I can’t believe I haven’t measured as I’ve made this so many times… I want to say 4-5 cups. This is a good question and I’ll be sure to update the recipe and share it with the FB group when I do! I made this yesterday and got approximately 22 quarter cup servings. I froze the mixture in silicone muffin cups and they were easy to pop out into a large ziploc for freezer storage. I love this idea of making a flavour base in advance to make tasty easy meals! My question from yesterday is whether onion masala may be substituted for the spice ingredients in the butter chicken. If so, what would the substitution amount ge and should I still add the spices in the recipe as with the Aloo and peas? You can sub it in any recipe calling for the same ingredients (tomatoes, onions, spices). I suggest following the recipes in my series to get the hang of using the masala, then hopefully you’ll feel confident using it in any recipe! 🙂 My guess for the butter chicken would be 1 cup. Hi, Ashley! If using canned tomatoes, do I drain it first or use the liquid in the can as well? Thanks & can’t wait to make this! Hi Fenny, use the whole thing so liquid and tomatoes. Can’t wait to hear what you think! I was having a lot of fun making this until the Instant Pot gave me the dreaded “burn” indication and wouldn’t pressurize. That seems to be the risk of not having additional liquid in the recipe. after a bit of deglazing I’m putting the bowl through a wash cycle before scraping the saved masala back in and trying again. Wish me luck! Other than ramping up my stirring, any suggestions on how to avoid this? I used canned diced tomatoes – and yes, I included the juice. Thanks for any ideas, I’m still new to pressure cooking. Hi Ken, just now seeing this comment but I replied to your comment in the facebook group earlier today. I’ll share my reply here too incase you see it sooner: the burn sign comes on sometimes if the IP detects that something on the bottom has burned but it sounds like you removed any burnt bits before starting. Does this happen with other recipes too? I’ve made this many times without adding water and haven’t had this happen so something is up… Knowing that it eventually turned out well for you makes me think the sign came on because the mixture was thick. I *think* the burn sign is only an issue if the pot doesn’t come to pressure due to something scorched on the bottom. Hi there, I tried to make this recipe for the first time today, also my first time using the instant pot. I got the burn error 3 times, each time I added more oil but it still kept burning the mix to the bottom of the pan, also thoroughly cleaned the pan between each try. The mix is now swimming in oil and we’re going to try one more time turning the heat level to “less” instead of “normal”. Any other tips? Can we do this with red onions? If so, do we use the same proportions? Michelle, yes, you can definitely use red onions! I just suggest yellow because I feel it gives the masala a slightly sweet flavor. 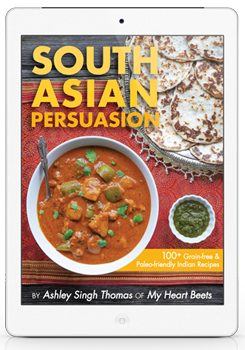 Let me know what you think of the masala and any recipes that you try! In this recipe, when you say npr , do you release pressure after 10 mins, or do you wait till valve comes down? I wait until the valve drops on its own but you can probably release pressure after 10 mins with this recipe if you’d like. Hi Ashley. I know your recipes that call for onion masala explain wether or not we can use the cubes still frozen but could you explain how to determine this ? 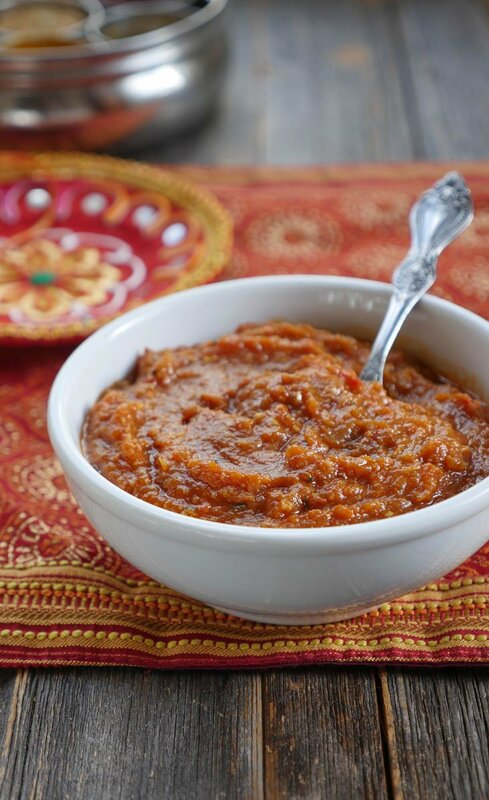 I’m experimenting with using the onion masala in other recipes… thanks! Hi Michelle! If the recipe calls for some liquid (like dal or chicken curry) then you can add it in frozen. If it’s a dry dish or a stir-fry on the stovetop, then I would suggest thawing it first. Hope that helps! Thanks! Also, can we double this recipe or will this cause problems w the onion browning? I have an 8qt ip. You can double it! It’ll take longer to brown the onions but that should be the only thing! Should the tomatoes be skinned first or just chopped? 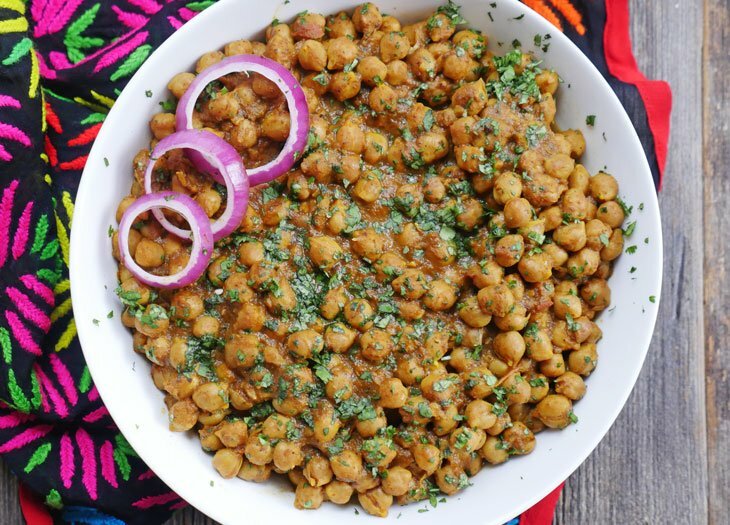 Thank you for such an amazing idea to store masala! I made my first batch of masala today. However, my IP showed “burn” error after the pressure was achieved so I had to release the pressure immediately(before 5 mins). What might have went wrong? I used 3 medium size onions and 4 normal size roma tomatoes. Did I put less number of tomatoes? Or did I saute for a long time? 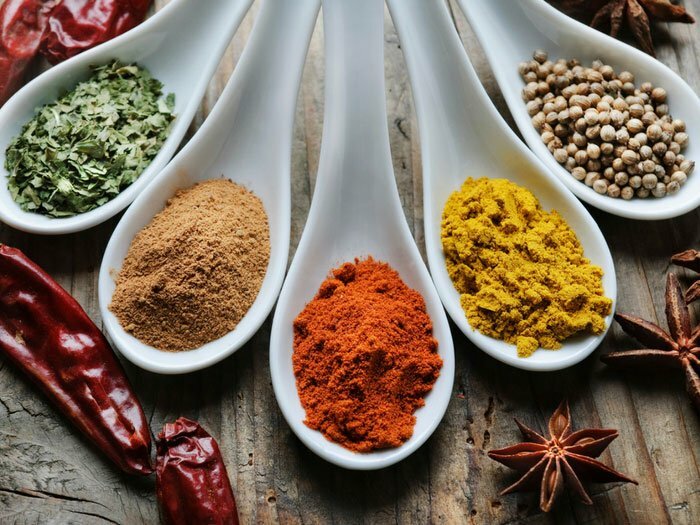 This is such a great idea and makes cooking Indian food so much easier but still full of flavor!! Thank you so much! I’m making this right now, but after 20 minutes of sauteing, my onions are still as white as when I put them in the pot. I wonder why? * The onions were quite soft, so I went ahead and followed the rest of the recipe; the masala came out quite well! I may have over-blended a bit, as yours looks a little chunkier. That’s fine–the flavor is great! Thank you for your recipes. I’ve made several and have enjoyed all of them. I do not have an immersion blender, can I pulse it in my regular blender till it because crushed like? Yes, you can make it smooth too if you’d like 🙂 It’ll be great either way! What about not adding the spices until you cook your final dish and just cook and freeze the onion, ginger, garlic and tomatoes adding spices later? Perhaps this cook give the dishes some variation. Also gives the chance to do try south vs. northern India? Thanks so much for sharing this! Quick question, if I were to make this fresh every time I made a recipe that required it, can I just divide all the ingredients by 6 to get one cup? Since this makes about 6 cups of onion masala, would that be a good approximation? I haven’t tried it this way but I don’t see why it wouldn’t work 🙂 Let me know how it goes! Quick question: why the spices? Seems like it’s better to add them fresh when you use the masala, and also it’s hard to adjust a recipe when there are spices already added. Thanks! Charles, totally up to you as to whether you want to add them in or not 🙂 I find it easier as I have less work to do when I make recipes – I just add additional spices as needed. If you make any of my recipes that call for onion masala then just add extra spices when making a dish. Hope that helps answer your question! Inna, you can definitely add salt if you’d like! I usually just add it directly to the dishes I am making (I have a toddler so I try to be mindful of salt for his portion, then add extra to ours). But feel free to adapt the masala to your taste! Have you by any chance tried this using a good tomato puree? I am making this right now and am so excited about all the recipes that i can make with it!! I’m having issues with burning soon after i started pressure cooking. I added water a couple of times and it still burned. (This happened with the saag recipe as well). Does anyone have this problem, and any potential explanations and solution? Thanks! Agnes, I have heard that the burn sign can come on if the IP detects that something on the bottom has burned – were there any burnt bits once it was done? If the pot reaches pressure then the dish should turn out fine… let me know! Wonderful recipes. Thank you! However, this recipe caused my first major Instant Pot fail. Like some others who’ve commented above, I got the “overheating” error. I poured the contents into a bowl, saw that there were onions burned to the bottom of the Instant Pot. I cleaned it completely, poured everything back in, and tried again thinking I had solved the problem. To my surprise, I got the same error again. When I again poured out the contents, I found that again onions were burned to the bottom. So, I put everything in a pot and cooked on the stove (doubling the 5-minute pressure cooker time, which from a comment from you above, probably was not enough.) FYI, I used fresh Roma tomatoes, not canned. They had relatively little liquid. It seems like the amount of liquid in this recipe is key. It’d be great if you could comment on how to evaluate when there’s enough liquid and what to do if there’s not. Thanks! Thanks Michael! I’m sorry to hear you got the burn error too – I’ve never had this happen but it seems like if there’s anything stuck to the bottom then the error can come on. I’ll include a note in the recipe – but if you are getting a burn error the best thing to do is to deglaze the pot with a bit of water to make sure there’s nothing stuck at the bottom. I can not thank you enough for how much you have put into these recipes that you have shared!! I love authentic Indian food and making it in such little time seems like a miracle to me. I recently shared this with my mother who finished her first batch of Onion Masala today. The IP and these recipes have changed my life!! Thank you so much. Evan, this just made my day! I really appreciate the kind words 🙂 I’m so glad you’re enjoying my recipes! Hi, Ashley! Love your recipes and looking forward to making this onion masala. Can I make it in a slow cooker instead of an IP? Thanks, Sybil! I’m sure it can be done but I haven’t tested it out myself to know the times or anything. If I were going to use a slow cooker, I’d first add the onions and slow cook them until caramelized, then I’d add the tomatoes and cook longer. Please let us know how it goes if you try it this way! Irene, I’m so glad you made the masala! 🙂 I can’t wait to hear what you think of the recipes you make with it! I made masala in my new Instant Pot Ultra. I’m at 2500 ft elevation, so I set the Pot accordingly. I used 4 Roma tomatoes and one can of diced tomatoes (I failed to buy enough Romas). I sauteed the onions for 20 minutes, and they still had a lot of moisture. After starting pressure cooking, I got a BURN error in a few minutes. I emptied and cleaned the inner pot, added more oil and water, and started it again. Got another BURN message! Cleaned the pot, and added even more oil and water. This time it worked. Thankfully, the BURN message and shutdown happens before any flavor-spoiling major burning takes place! Next, I’ll try some recipes that use this masala, after which I’ll rate it. Do you have any guidance on making this in a regular pot? (Nickel allergy = no IP for me!) I’m guessing that most of the steps would be the same, but it’s more a question of how long to let it cook down for/when to add the spices in. Hi Ashley, I am excited to try this. I have an “mini” instant Pot though. Should I cut the recipe in half? 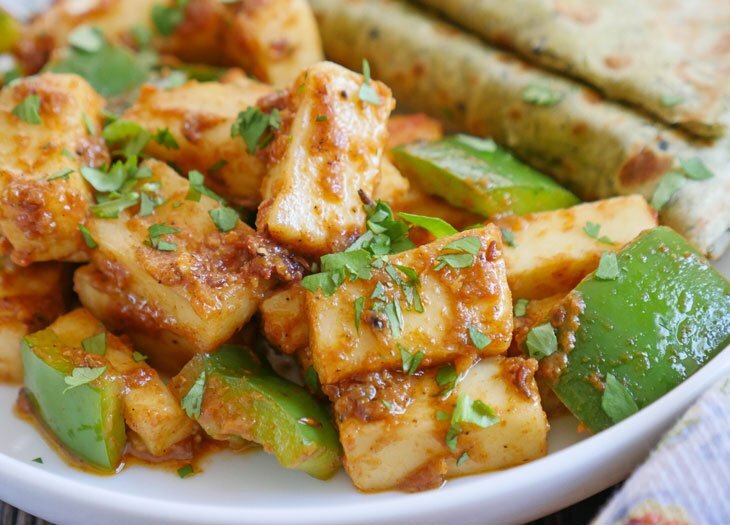 Hi Ashley, I’ve made this before and spent quite a while chopping, which was well worth it given all the delicious recipes that came from it (even my mom who was born in India was impressed with me haha). But I am about to make another batch today and had a quick question. Instead of chopping, would putting the onions and then the tomatoes in a food processor work? Or would that change the flavors/carmelizing? Thank you! I honestly can’t thank you enough for your recipes. They make me feel like I’m home again and I just am so appreciative to have stumbled upon the website and FB group. When I made the sauce, I did not put masala in it, and I left it when I made curry? Do you leave spices in the sauce when you make curry? Yes 🙂 You can add additional spices depending on what you make with the masala. If you use one of my onion masala recipes it takes into account the spices in the masala so I just list any additional spices you’ll want to add. Thanks so much for this! 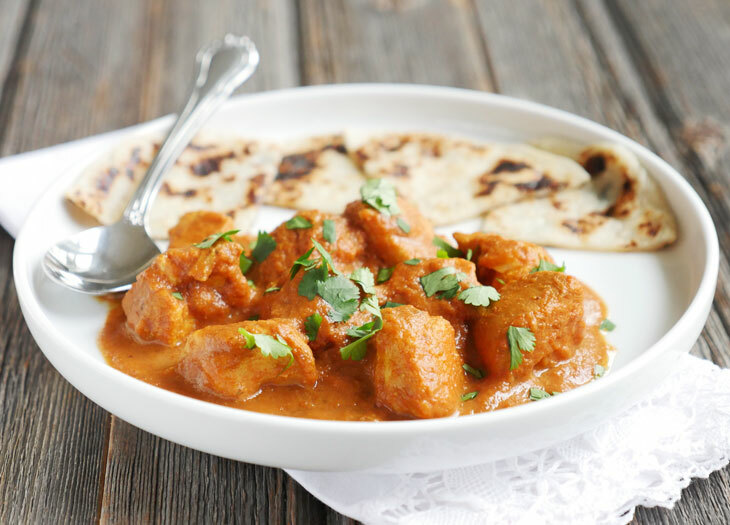 I made a batch today after finding your recipe for Instant Pot Indian Chicken Curry and I froze several portions to use as starters for other dishes in the future. I love cooking (and especially EATING) Indian food, but sometimes the prep work can be daunting. This will make sure we’re eating lots more flavorful dishes in the near future! Alison, I’m so happy to hear that you found this recipe! I can’t wait to hear what you think of other recipes that you try using the masala! Hi! If I don’t have this onion masala available and I want to make your shrimp curry, what are the proportion for doing it with the recipe? 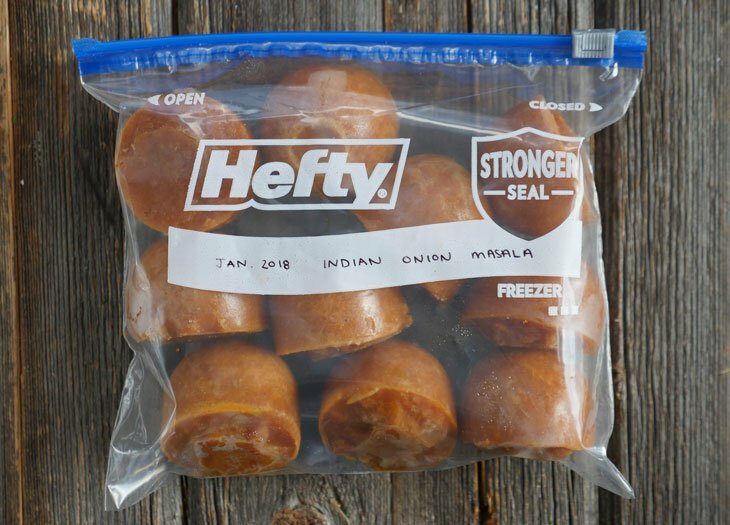 Would this work if I froze the tomato/onion/ginger/garlic without the spices and add them when I actually use the frozen masala cubes? Just wondering as different recipes call for different spices. Thanks in advance! Hi! Thank you so so much for this series. It’s cold here so thinking canned might be better. Any need to add sugar in your experience? 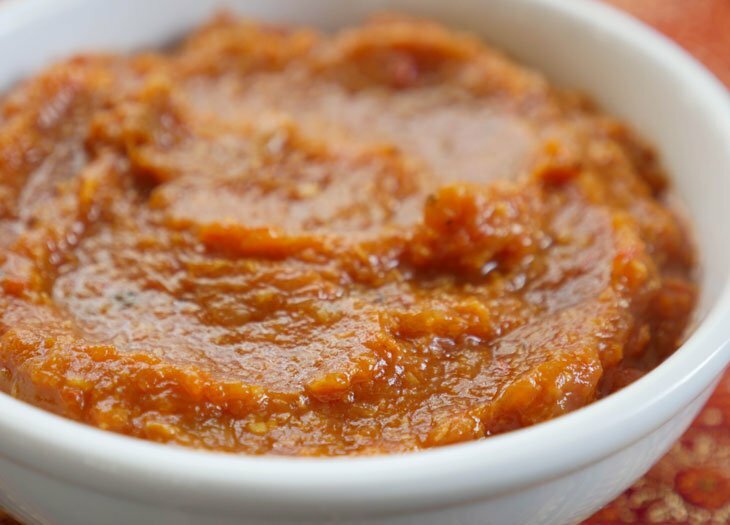 Hi–do I need to add sugar to cut some of the tartness of canned tomatoes? Just made this and used a muffin pan which worked great for the 1/4 cup servings. I am sold on doing this for all my cooking needs. Thank you for making my life easier. Shilpa, that’s awesome! 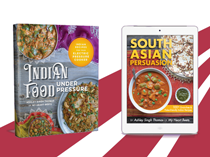 I’m so glad you like the idea – let me know if you try any of the recipes from my onion masala series! HI Guys I have had 2 Burn messages not a happy chappy at the moment…last time I added extra water but still got the burn message on the 2nd attempt. I have turned off the pot now so will I add extra water again as my chopped tomatoes were quite thick, how much water is enough please ? Hi Ashley….I am making the Onion Marsala and have tried 4 times each time getting the Burn message this last attempt I have added 2 cups of water to the mix and it seems to ok now as reached pressure and counting down for 5 minutes…my tinned tomatoes were the Mutti Brand of finely chopped tomatoes, so quite alot of water had to be added so do I need to boil off some of this water ? I don’t have an Instant Pot. 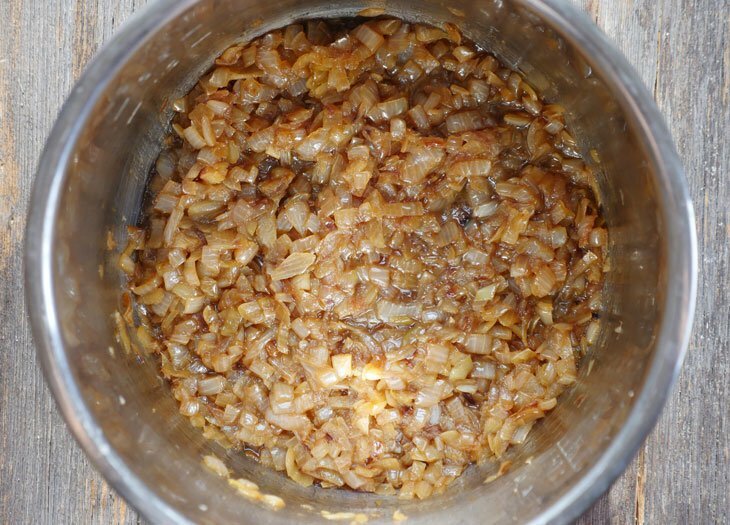 I do have a crock pot, and I have successfully caramelized onions in it. If I cook the onions first separately, do you have any suggestions for how long I should cook the onions with the tomatoes and everything else? At a low or high setting? 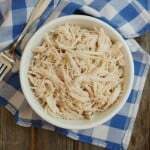 Hi Ashley, Ive made this recipe twice in the 6 quart instant pot duo. Both times I have had the burn error immediately, despite carefully following the instructions. In total Ive had to use two extra cups of water. I wonder if I have to boil this extra water off at the end to get the same volume- at the moment it looks more like a curry than a paste! Hi Reenam! I wonder why you’re getting a burn error – are you using a 6 quart? Is this with fresh or canned tomatoes? Just trying to see if we can troubleshoot. I don’t add any water so 2 cups seems like quite a lot – yes, you’d need to boil the water off at the end. Yes I am using the 6 quart pot. I used canned tomatoes. I have made this masala a few times, and each time I seem to be unable to get away with even reducing the water quantity to one cup! I am quite meticulous about ensuring there are no burnt bits before I put the pressure function on. I tried increasing the volume of oil used to 3/4 cup but it didnt make a difference! Thanks so much for your help! You can keep the exhaust on and open up a window – or wait until he is out of the house? It may be better to get it all done in one day vs. cooking onions for several days. Hope that helps! I think you just changed my life with this idea! Hi Ashley, love your blog! 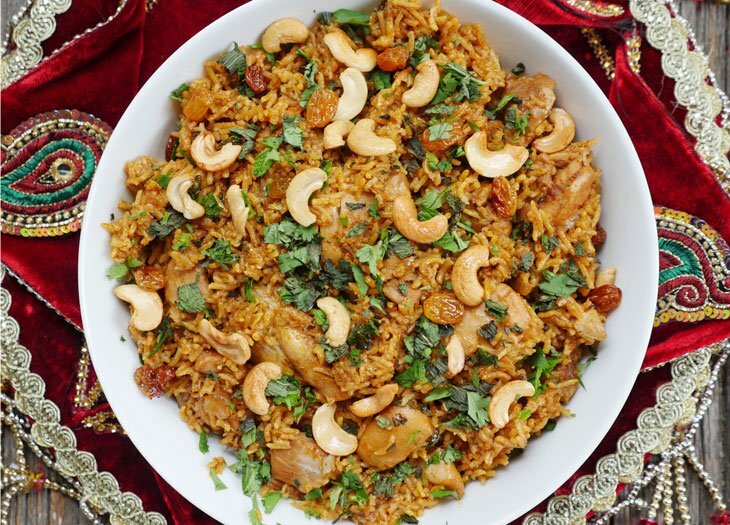 I’ve tried a few ‘masala’ recipes and really want to give yours a try as well. I noticed you don’t add a ton of spice to the nasal, unlike a lot of other recipe’s I’ve used. Is this because you add the spice later, (whenever you use your masala cubes)? Just curious, whether I could add more cumin and other spices…or if you recommend adding them later. Thanks! Thanks Shilpa! 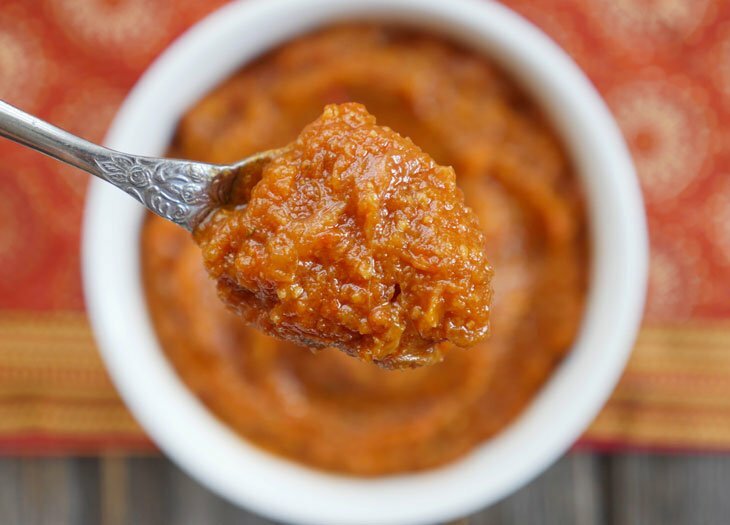 Yes that’s because I do adjust the spices later depending on what I’m making – I suggest checking out a few of my onion masala recipes so you get an idea (https://myheartbeets.com/recipe-index/#onion-masala-recipes). You can always adjust the masala to your taste but I’d personally add them later! I cannot wait to try this. 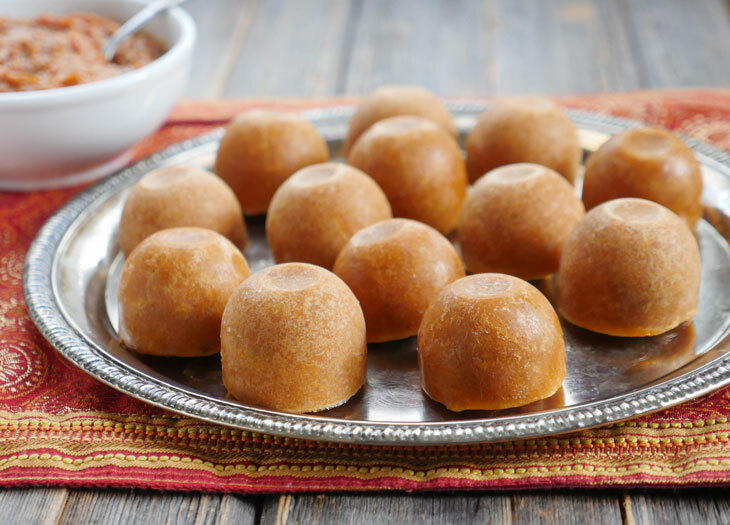 I am Indian and I cook Indian food all the time but i never thought of making this ahead of time, even though I make and freeze so many other things regularly. I did try the pre-fried onions available in stores and didn’t like it at all. With this masala, my cooking time will be reduced by so much! I love this recipe and use it all the time as a base for many dishes. I also got the burn message until I slightly covered the pot while cooking the onions so that they stayed a little moist. I also use canned diced tomatoes and that seems to have solved the problem. I have a time-saving tip that I use regularly! Since you blend everything at the end anyways, the cuts of the onions, garlic, and ginger don’t really matter. So I peel my onions and run them through a slicer blade in the cuisinart. It’s SO much faster than chopping by hand. Then I rinse out the cuisinart and throw in my peeled garlic and ginger with the chopper blade. This really speeds up prep time. This is awesome. 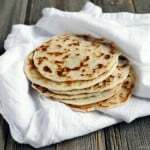 For simplified cooking method please check for OPOS recipes. Just google it. You have to try. Its easy and gives authentic taste too. I thought you should know about it. this recipe and all these recipes look really good. is there a stovetop recipe for the onion masala? I am absolutely in love with your site, and every recipe I’ve made so far! (have made the butter chicken a few times, your korma with lamb, and the Chicken Biryani. Each of them has been so easy and delicious! Thank you so much for sharing! Tonight I’m making the Toor Dal and finally had to break down and make a batch of the onion masala. While a bit more time consuming, it’s great to know I’ll have a bunch frozen for future meals. I’ve never actually had onion masala when not already in a dish so cannot say for sure if it is ‘legit’ but it sure smells legit! Your directions are always very direct and easy to follow, I’m excited to whip up the Toor Dal for dinner in a few hours!